The Latino Arts Festival provides an opportunity for Latino artists, through various media, to share their works with the community, an option of this level not typically afforded to them. The Latino Arts Festival will feature the work of local Latino artists who represent visual art, music, lowrider builders/artists, and youth art. The artists will introduce concepts that influence, educate, and celebrate family and community through Latino art and culture. The festival is free and open to the public. The Latino Arts Festival is a culmination of a project spearheaded by Downtown Shareholders of Kansas City, Kansas; El Centro, Inc.; 1 of a Kind Paint & Body; and Deanna Munoz (Individual Contributor). 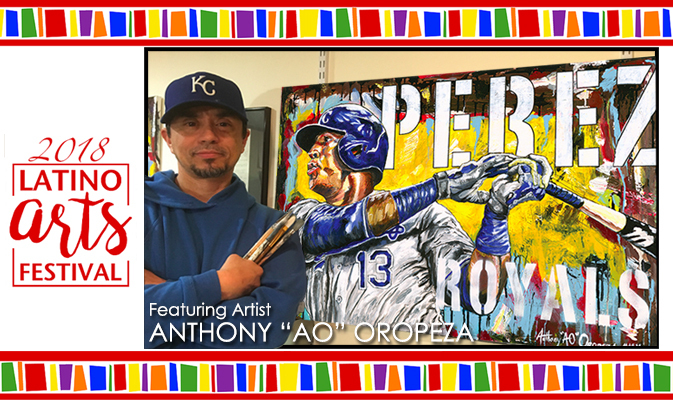 Kansas City, Kansas native Anthony “AO” Oropeza, who grew up in the KCK Argentine district, is the first honored Latino Arts Festival 2018 Featured Artist. Anthony will be honored at the preceeding Latino Arts Fest fundraiser – kickoff event with a special Proclamation by Kansas City Kansas Mayor, David Alvey. The event fundraiser will also serve as a sponsor recognition event, with additional invitees such as the KCK commissioners and the Mayor of Kansas City Missouri, Sly James. AO, who donated is time and art to thousands of KC metro students throughout the past 20 plus years with his AMIGOMAN™ comic book creation and free art classes has been an unsung community hero in his own right. The eldest of four, and a product of a single parent mom, AO, with his perseverance and no-quit attitude was determined to achieve his bachelors degree. That no-quit attitude allowed him to achieve a Degree in Communication from Rockhurst College, and did so in a total of eight years, not before earning two associate degrees from Kansas City Kansas Community College in the process. Following his success with his comic book work, AO has had huge success since 2013 with his sports art. With clients or owners of his work with the likes of Major League players or families such as: future Hall of Famer Albert Pujols (Angels), Jarrod Dyson (Arizona Diamondbacks), the Yordono Ventura family, Danny and Sara Duffy KC Royals), Dee Gordon (Seatle Mariners), Eric Hosmer (San Diego Padres) and Salvador Perez (KC Royals). AO is building quite a portfolio of major league clients. Along with the AMIGOMAN™ comic book school visits and the incredible sports art, AO over the past 20 years has also shown his desire to help many local charities including schools, churches, large and small corporations and various local charity organizations across the KC metro and beyond. He is known as a very generous donor by donating both original and print production comic book and sports art throughout the years. At the festivals fundraising event, AO, a native of Kansas City, Kansas, had the huge honor receiving a proclamation for his hard work with various communities in the metro throughout the years from Kansa City, Kansas Mayor David Alvey (a owner of AO’s art). AO was also honored my a special appearance by the KCMO Mayor Sly James (another owner of AO’s work). Both spoke on behalf of AO and festival founder Deanna Munoz.